The "Promise Award: Youth Achievement Award"
2013 - "Recognizes a high school student who has demonstrated achievements in the areas of the arts and academics and serves as a model of promise for a brighter future." JOSH GIBSON AWARD for Business (2013) - recognized for being a community leader in the Pittsburgh region! Chicago IL was the site of the 2012 Black Enterprise Conference, where Amber was named the 2012 Teenpreneur for Black Enterprise Magazine! 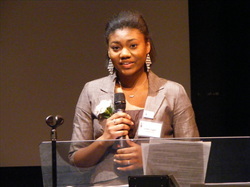 At the conference, Amber participated in the Teenpreneur workshop, and shared her story and balloon art with attendees. 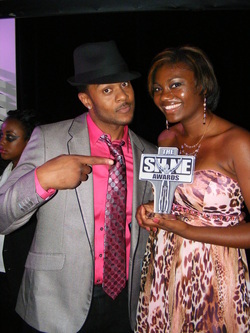 She met many successful African American entrepreneurs and other professionals. Amber appeared in the August magazine publication. Amber was named the 2011 Global Young Entrepreneur of the Year, an honor that only 24 young business owners receive in the world! The award is sponsored by The Goldman Sachs Foundation, and is a top honor given by NFTE (The Network for Teaching Entrepreneurship www.nfte.com). Amber was awarded the honor by Entrepreneuring Youth, a licensee of NFTE. The Eighteenth annual "Dare to Dream Awards Gala" was held in New York City, April 13, 2011. Amber was rewarded with the Beaver County Rising Star Award at the Beaver County Women's Conference in early 2012, recognized for her positive contributions to the community, and entrepreneuralism. She was the only youth to receive the award! In November, 2011, Amber received a tremendous honor from her community! " The Foundation is pleased to recognize Amber J. Liggett in 2011 with its first-ever Youth Entrepreneurial Spirit Award.”~ The Beaver County Foundation, Beaver, PA. Additionally, she received a Senatorial Certificate of Recognition from Senator Elder Vogel Jr., as well as The House of Representatives Citation, from Pennsylvania State Representative Jim Marshall. 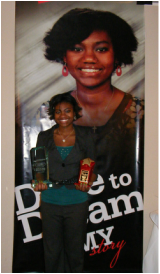 During October, 2011, Amber competed and emerged a successful semi-finalist - one of the top twelve of 20,000 NFTE competitors! She received praises from the judges for delivering a “flawless presentation”! Ernst & Young 2011 Emerging Young Entrepreneur! On Friday, June 12, 2011, Amber was recognized at the Ernst & Young Gala in Pittsburgh, PA as their 2011 Emerging Young Entrepreneur! She had the privilege of introducing Mr. William V. Day, President of St. Barnabas Health System to gala attendees. Amber enjoyed meeting Mr. Day and the 2011 Ernst & Young finalists and winners. Congratulations Amber on a job well done! 1st Place winner of the George W. Tippins Youth Entrepreneur Regional Business Plan competition! 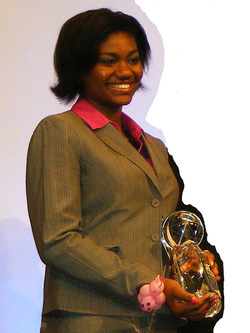 On Thursday, June 2, 2011, after three rounds of competition, Amber (the only Freshman to compete) won 1st place in the George W. Tippins Regional Business Plan Compeititon! 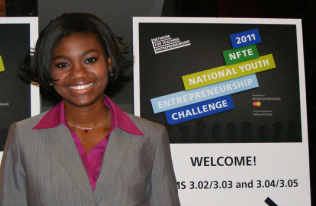 She advanced to compete in the NFTE National Entrepreneurship Challenge, held October 6, 2011. On April 30, 2011, Senator Elder Vogel presented Amber with a Senatorial congratulatory citation, which "affirmatively states that she is a role model worthy of emulation; and offers best wishes for success in all future endeavors." Amber had the honor of participating in Senator Vogel's Children's Expo again this year (for the third year in a row), and made balloon creations for hundreds of children. She now proudly serves on Senator Vogel's Business Advisory Board.